Ready for the ring? Try these subtle hints! Let’s set the scene. You and your man have attended the weddings of all your friends, been together for a good amount of time, and have had “the talk.” You’re feeling very ready for that ring already! Receiving your dream engagement ring (along with an equally dreamy proposal) is the first step in the process of tying the knot. But now, the age old question: how to get the engagement ring you want? Most women want to have the perfect surprise engagement with the ring of their dreams… but there-in lies the problem. How can you make the princess-cut diamond ring with the rose gold band a reality, when you can’t tell him exactly what you want? Well ladies, it’s time to get stealthy with these engagement ring hints. If you have a good poker face, casually stopping by a jewelry store on the weekend is a good option. You can peruse the store’s selection together, pointing out specific cuts, settings, bands, and gems that you prefer. If a conflict-free diamond, or a vintage halo setting is important to you, mention that! 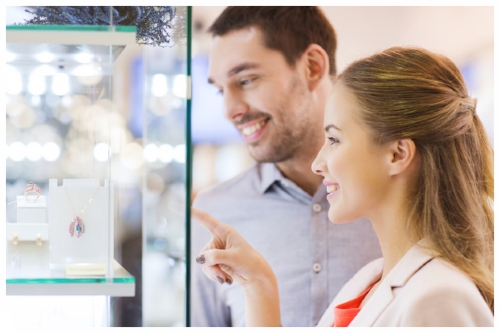 You should be able to try on engagement rings with the help of a salesperson, and show enthusiasm for your favorite ring styles. If you’re in the market for a unique engagement ring, enlisting the help of a close friend or family member may be the way to go. Looking for a sapphire, emerald or black diamond? Start creating a Pinterest board, and save Instagram posts with your favorite styles to share with your chosen confidant. Your fiancé should get the ring hint loud and clear from this person, and be able to purchase the right ring with certainty that you’ll be over the moon! While this option is a little more subtle, it’s a good choice if you’re feeling flexible, and want to be completely surprised! Want a modern, yet delicate gold engagement ring? 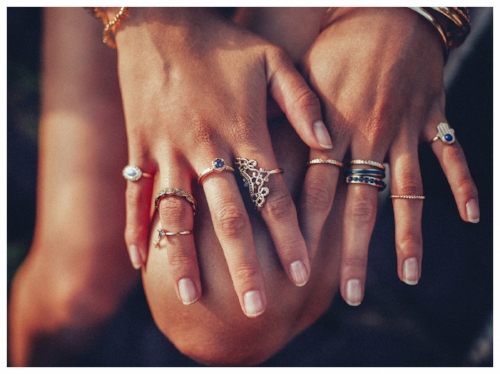 Wear delicate stacking rings, and layer necklaces in the same style for work. If you have a flashier style, or fancy a black diamond on a white gold band— reflect that in a pair of earrings to wear on date nights. When your fiancé finally walks into the jewelry store, he’ll picture your daily jewelry and purchase a ring that uniquely fits your taste. We hope these ideas will give you some clarity on how to get the engagement ring you want— may your left hand shine bright with a diamond soon! Helen Schultheis is a Brooklyn based copywriter and on-set fashion producer. She enjoys traveling, vintage shopping and loves a good dirty chai latte.